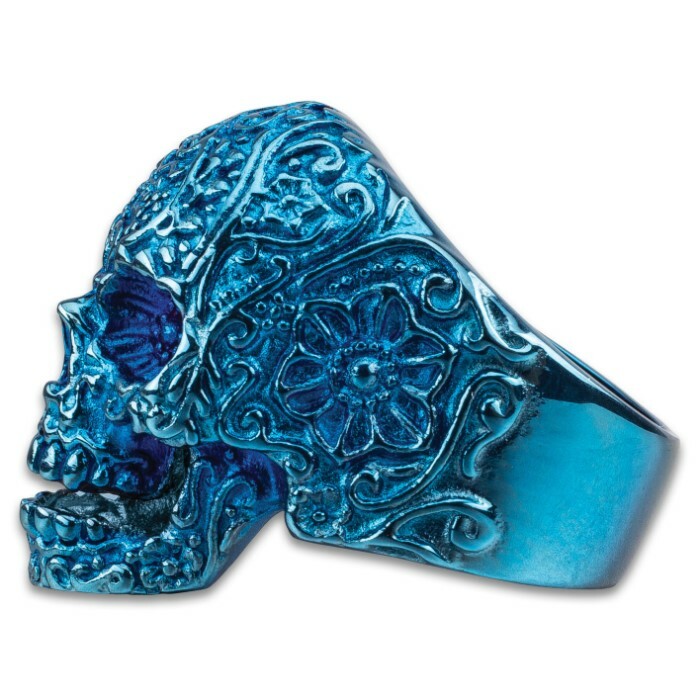 Blue Sugar Skull Ring - Crafted Of Stainless Steel, Remarkable Detail, Corrosion Resistant - Available In Sizes 9-12 | BUDK.com - Knives & Swords At The Lowest Prices! 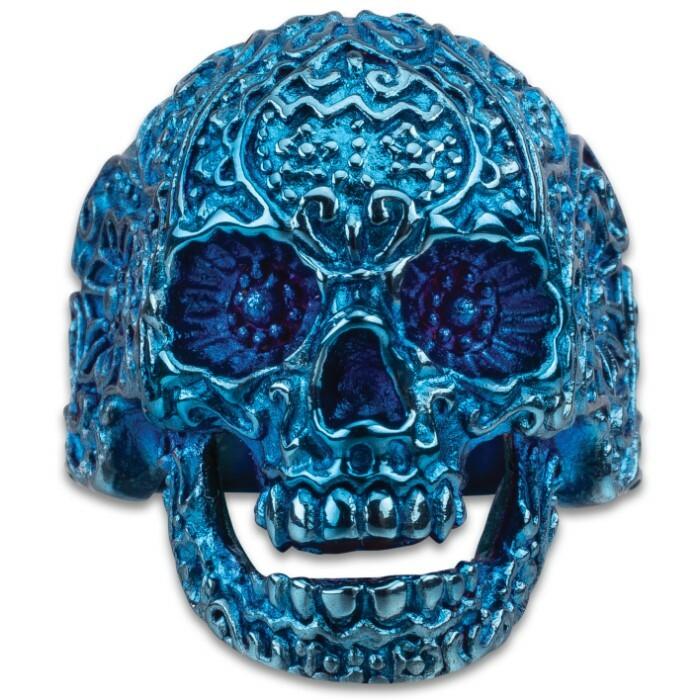 Beautifully cast and extraordinarily detailed, the wicked-cool Blue Sugar Skull Ring depicts a classic intricately detailed sugar skull in a vibrant blue. The delicate texture, brilliant contrast and painstaking attention to detail is remarkable, with even the tiniest ornamentation clearly visible. The ring’s high quality stainless steel construction boasts a sheen, corrosion resistance and durability that simply can’t be matched by more traditional - not to mention expensive - ring materials. Precious metals like silver and gold tarnish and fade, and even advanced modern ceramics are prone to chipping. 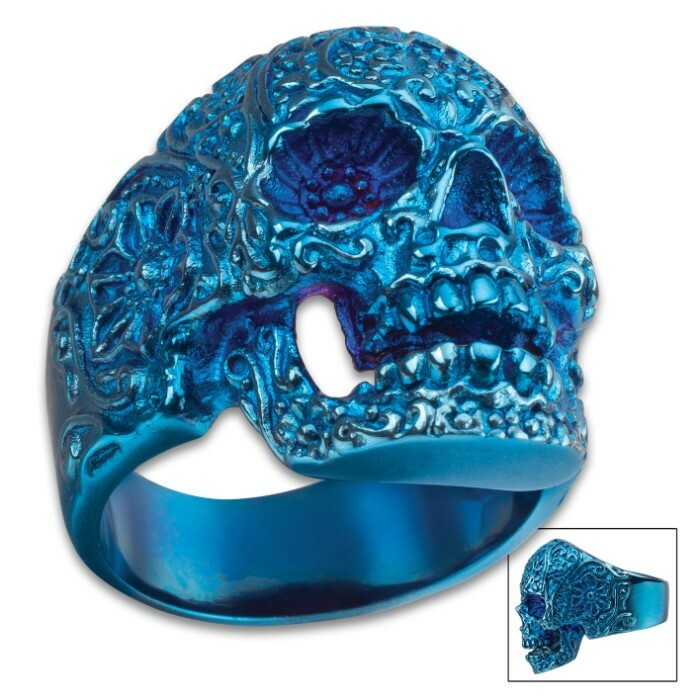 This ring, however, is truly forged for a lifetime of vigorous wear, so you needn’t fear damage while performing carpentry, vehicle repair and/or maintenance, and other hands-on work. This cool ring looks great on practically anyone, enhancing any outfit or personal style. It’s a superb choice - for a ride on a motorcycle, a night on the town or simply as an everyday fashion accessory. It also makes a fantastic, memorable gift, and, available in sizes 9-12, we’ve got the right fit for any man!